This is a special episode of the podcast because it is the first anniversary of starting the podcast! I can’t believe a year has gone by already! In this episode I talk about what I think has been the most important things that have happened in marketing and where it is going for your veterinary practice. I also answer some questions submitted via email by listeners. Thanks to everyone who responded to my email request last week for questions! It has been an amazing experience developing a podcast and growing it and I want to thank everyone who has listened and contributed along the way! I love connecting with listeners and I love doing the podcast, it has definitely made me a better marketer. When I started I never would have imagined that so many people would listen and that I’d be able to meet so many awesome people through the show. I’m definitely going to continue doing the show so long as I feel I’m able to provide value and create good content. I’ve been amazed at all the people who have reached out and one of my favorite things to see is when a practice starts trying and testing new marketing at their practice. Most practices and people won’t take the time to learn and execute new marketing ideas, so if you’re willing to test out new ideas you’ll likely be successful because there just isn’t that much competition out there. In this episode I cover topics on everything from what you should focus on in the next year and also cover some great questions as well. Topics on the questions ranged from what would be the top 5 things you would do if a practice only had a website and a yellow pages ad to what is the biggest mistake you see veterinary practices making. Thanks again to everyone who listens and be sure to reach out if you ever need anything! 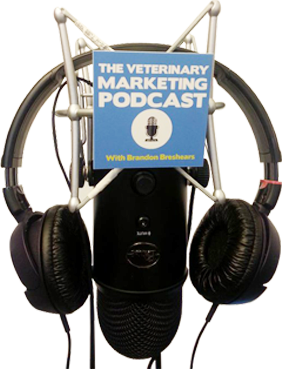 Happy Birthday, Veterinary Marketing Podcast! Thank you, Brandon, for all the work you’ve put into this show. I learn something new just about every episode, and it keeps me thinking creatively about our marketing and our relationships with our clients. Thanks for inspiring!